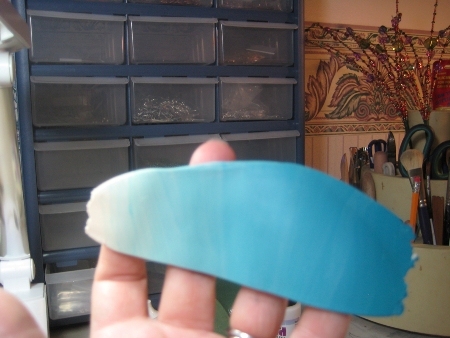 I’m going to show you how I make one of my split pendants. 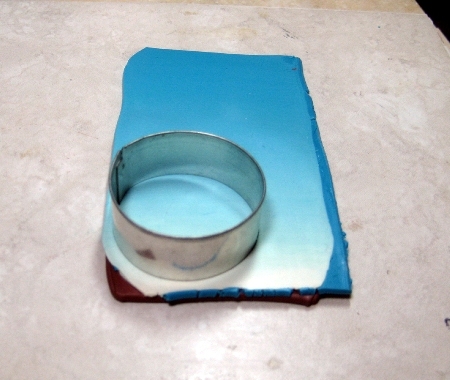 It involves using a Skinner Blend, a simple cane, and a “gem” I make out of alcohol inks and silver leaf. 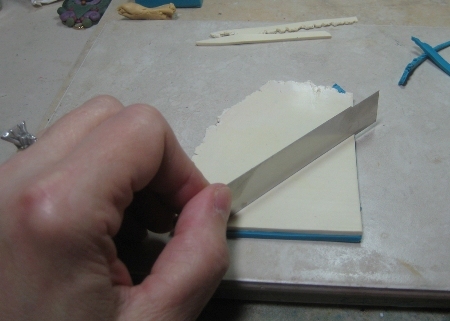 The first thing you have to do when working with polymer clay is to condition it. 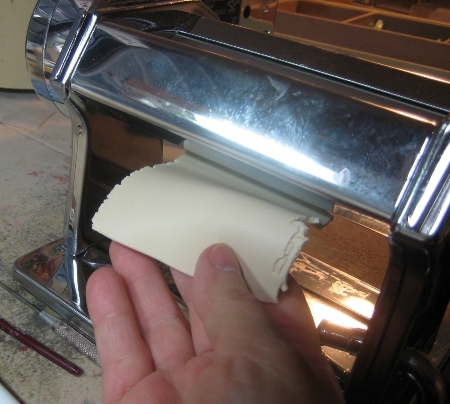 You can do this by rolling it out with a rolling pin, kneading it with your hands, or any number of ways…but the best and easiest for me is my pasta maker…and with a motor on it it’s even easier! 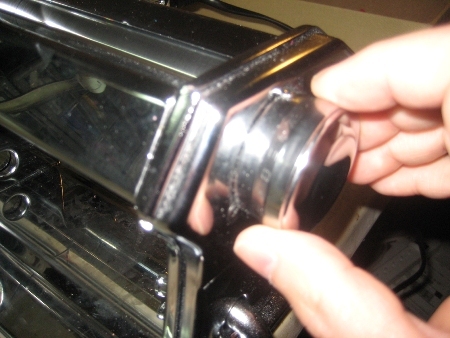 You just push the clay through the top and it comes out underneath at whatever thickness you’ve set it on…there are between seven and ten usually on a pasta maker. Once you’ve put it through a number of times, it’s conditioned and ready to use. The first thing I want to demonstrate is the Skinner Blend, so called because of the person who figured it out…Judith Skinner. She made it easy to do a beautiful graduation of colors with just a few easy steps. 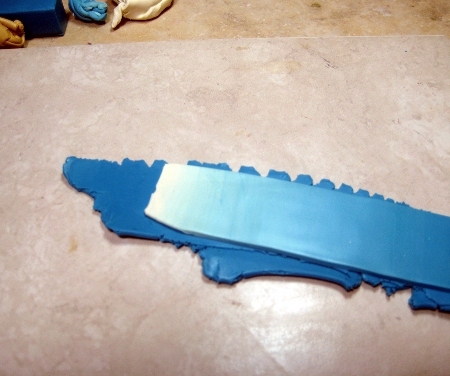 The first one is deciding which colors you want to use, and conditioning them…I’ve done my blue, now I’m doing a white clay. 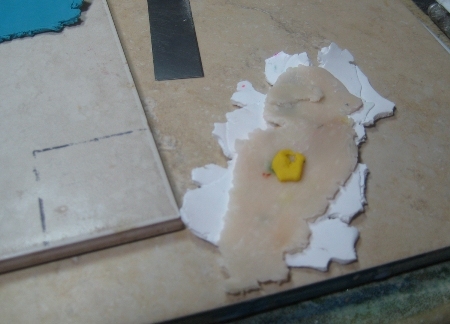 I’ve decided I don’t want a chalky white, so I’m adding a bit of translucent clay and a tiny bit of yellow..then conditioning it while mixing the colors together at the same time, using the pasta machine. 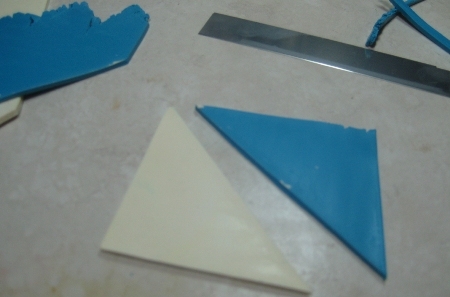 Once you’ve mixed the colors you want and have them the same thickness…you put one on top of the other, and using your tissue blade(very sharp)cut a triangle through both, so they are the same size. 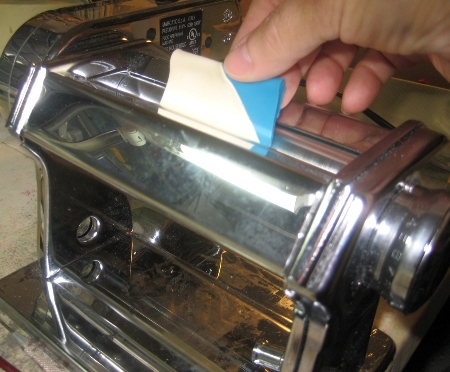 Squish them together a bit so they don’t come apart the first time you put them through the pasta machine…sometimes you need to overlap a bit..
Now, just fold it in half like in the picture, and put it into the pasta machine. Catch it, fold it again THE SAME WAY… and put it through again and again…it’s most important that you always fold it the same way. Keep doing this until you start to see a blending begin, then do it until you are happy with the blend…sometimes you can do it in five or six times, others it might take you twenty. I’m pretty happy with this graduation so I stop. Using a circle cutter, I cut out a circle on an area of the graduation that I like. Setting that aside, I start making my cane. 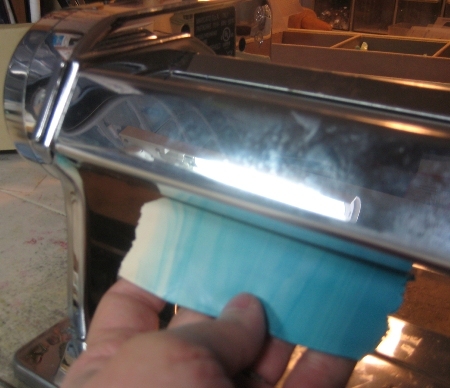 I”ve decided to use three complimentary colors and different thicknesses for this cane. 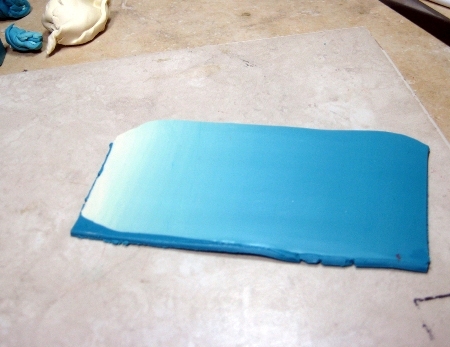 I start stacking the different colors and thicknesses of clay, rubbing them down a bit in between to get rid of air bubbles. 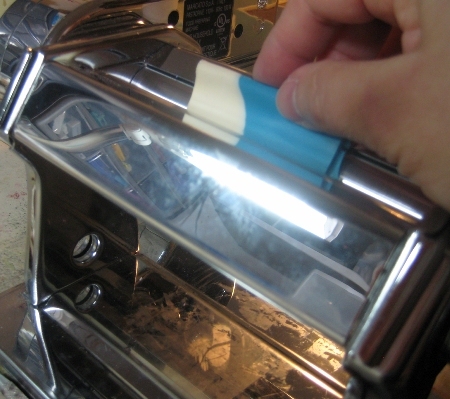 On this particular cane I want a repeat, so I just cut the can in half and put one half onto the other. 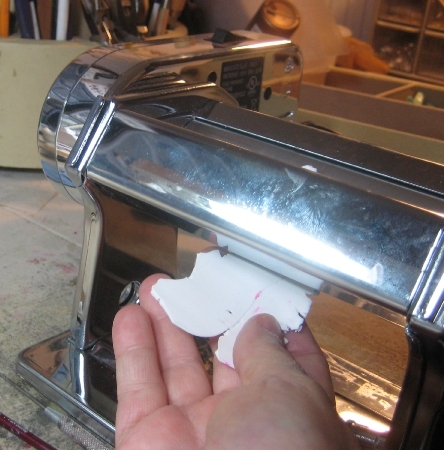 Slicing the end, I decide it’s what I’m looking for…and stop. 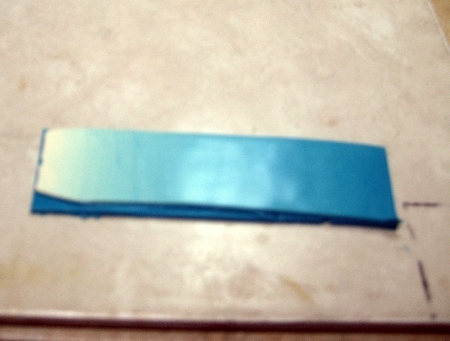 I line Up my two parts of the graduated blend I’ve already done and snug them up on either side of the cane slice. 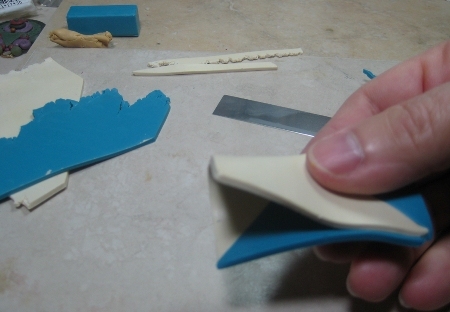 I add another sliced cane piece at the top, and start to add some small balls of the blue clay…here I’m using a brush to apply some liquid polymer clay, which will act as a glue to adhere the delicate pieces in place. 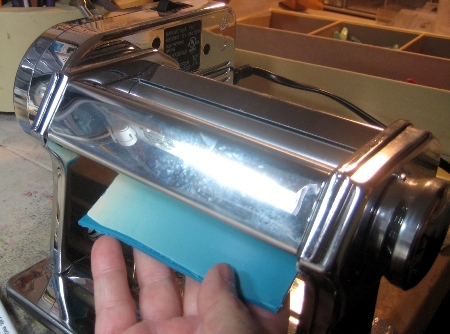 Then I prepare the covering, the super duper shiney thing we all love! 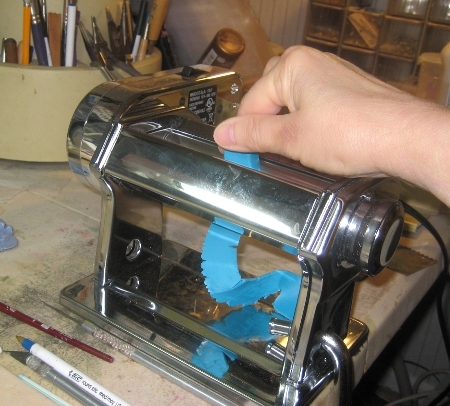 Then I take some Premo translucent clay and put it through the pasta machine, making it thinner each time I put it through until it is at the thinnest setting possible…. 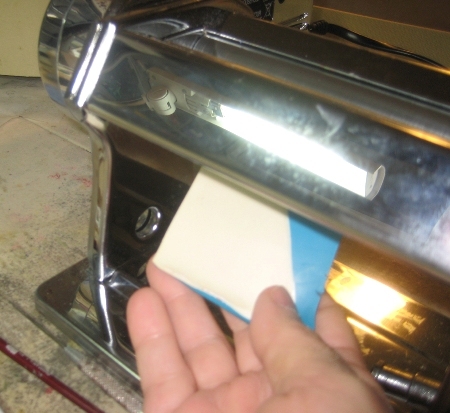 Sorry it’s kind of hard to see but in this photo I am putting the sandwhiched clay, leaf, inks and translucent top through the pasta machine…just once or twice, depending on how much crackle you want. 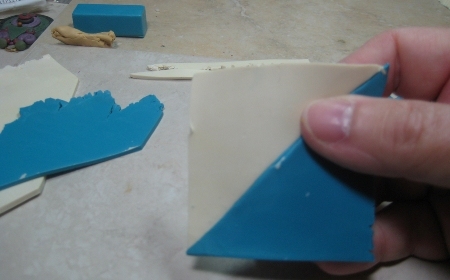 Cover the piece you made with the cabochon mold with this sheet of clay…trim the excess and stretch it carefully over it and underneath a bit too. Into the oven it goes…at 275 for about thirty minutes. 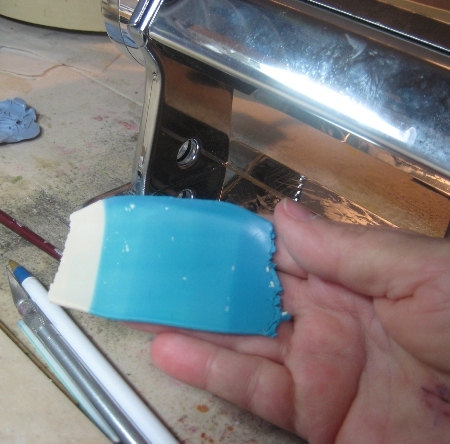 Some people like to use a dedicated toaster oven for their polymer clay. 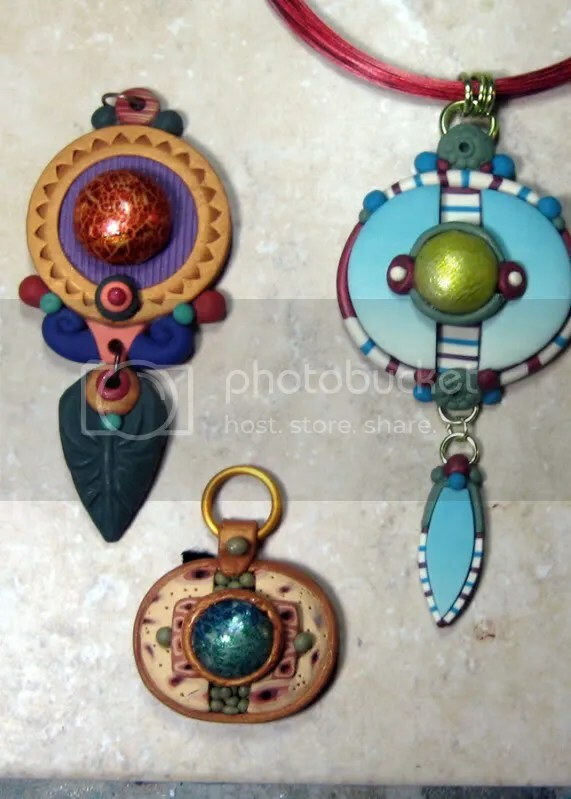 I will get around to that eventually lol..
Once that is done and fired again, I add a multistrand steel necklace and voila, my split pendant!